baked goods, as well as those who are making the pilgrimage back to all-natural, preservative-free gourmet delicacies. 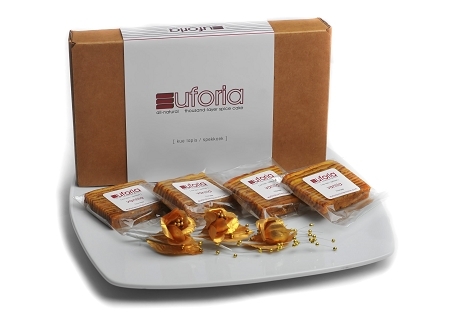 euforia™ is also available in a flourless variety for people who are sensitive to the gluten found in wheat flour, making euforia one of the most decadent gluten-free desserts on the market. Kartika started selling euforia™ in January 2011 as a tribute to her late mother, whose penchant for baking the Dutch-Indonesian classic cake left a legacy for Kartika to follow. Kartika's mother passed away in 2007, and creating a company around one of her mother's traditions was a way to honor the memories. euforia™ cake is headed to the 2011 Summer Fancy Food Show! We're pleased to announce that euforia™ cake will be among the newest merchants showcasing specialty food in the New Brands for the Shelf pavilion at the 2011 Summer Fancy Food Show, which this year will be located in Washington, DC. The event will be held July 10-12 and we will be offering samples of euforia™ cake to the estimated 24,000 show attendees. euforia™ is produced by Kartika's Kitchen in Tucson, Arizona. Kartika's Kitchen is an artisanal baking company dedicated to spreading a thousand delights to its customers through its euforia™ brand of thousand-layer spice cakes. Our cakes come in a variety of flavors and can be ordered *gluten-free. More information is available at http://www.euforiaconfections.com.